A new questionaire about the ISO/IEC15504 revision is now published on intacs.info. Go to the bottom of the page and vote ! intacs has established itself as the leading scheme in the spice world. No other scheme has by far such a level of industry acceptance as well as the number of certified assessors. During the Spice Days 2009 Peter Bölter, president of intacs e.V. announced, that intRSA has allmost dropped their buisiness and has no visibility in the market anymore. Former intrsa assessors are invited to sign off their program and get certified in the intacs scheme. This backdoor will be left open until June 2010. Holders of third party certificates are invited to proof their competence to intacs and join the scheme as well. This step was taken by intacs to give a clear signal to the market of the reliability and continuity. As a not for profit organisation, the main goal of intacs is to supply needed services to the members and support the community in their assessment knowledge. Two guide books on Automotive SPICE have been published in Japanese. Both of these books are published by Japanese leading publishing company Nikkei BP. These books are very popular in Japanese Automotive Industry for those who wish to do the process improvement activity based on Automotive SPICE. 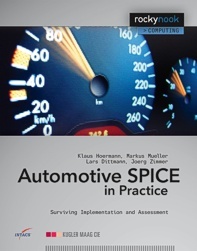 Automotive SPICE is a framework for designing and assessing software development processes. If implemented effectively, it leads to better processes and better product quality. It also helps to improve the cooperation among complex supply chains and between globally distributed development and engineering centers. Automotive SPICE has been derived from the ISO/IEC 15504 standard, also known as SPICE. It has been developed under the Automotive SPICE initiative by the consensus of several major car manufacturers such as Audi, BMW, Ford, Fiat, Daimler, Porsche, Volkswagen, and Volvo. Today, Automotive SPICE has become a standard in the international automotive industry. This iNTACS textbook with greetings of Alec Dorling is written as a guide to help the reader understand and interpret the requirements of this standard and to implement Automotive SPICE in a real world application environment. It is written for engineers, practitioners, managers, and project managers who need practical guidance in applying or implementing the Automotive SPICE framework in his/her company. Overall the intention of this release is to correct editorial mistakes and clarify some interpretations of the base practices and has a very low impact on the interpretation of the standard. The working group responsible for Automotive SPICE (AutoSIG) will decide on some major changes in October 2008. An additional release is planned for 2009. A significant change seems to be the explicit mentioning of the 'Mechanical' domain in ENG 9 System Integration Test. While implicitly required before, this change could mean that more attention will be placed on requiring representative from the mechanical domain when ENG. 9 topics are being audited.